We've been studying you. Pure steel. I haven't seen many like you. But... But you have to understand that everyone has a breaking point. A... point of pain. Particular primitive fear, maybe. But it's a nerve so... raw that your will doesn't exist to be factors. And then, all your little secrets, they flow from your mind to mine... until your mind no longer exists. This version of Castiel from Apocalypse World is considered a master torturer/interrogator in Michael's army. Since Sam and Dean were never born in Apocalypse World, this version of Castiel never rebelled against the angels or stopped the Apocalypse and turned against humanity along with the rest of angelkind. Like the prime universe's version of Castiel, this one uses Jimmy Novak as his vessel. This Castiel has a pronounced facial tic -- a lip twitch -- as well as a clouded-over left eye, suggesting that he might be half blind. In addition to operating from a more brutal and ruthless mindset, Castiel speaks in a German accent for an unknown reason and appears to be a coward, fleeing at the first sign of attack rather than fighting. Like the prime version of Castiel, he wears a suit and trench coat, although his is in a style reflective of a Nazi officer's uniform. Unlike the other angels of Apocalypse World, this Castiel does not fly or teleport for an unknown reason. He arrives on the scene driving a Humvee. Castiel is killed by himself. With the captured Charlie and Ketch proving resistant to the angels' interrogation methods, Castiel is called in to extract information from Charlie. Arriving at the Gas-N-Sip, Castiel tells Charlie that while she is strong, everyone has a breaking point, and he will find hers and when he does, all her information will flow out to him. As he places his hands on Charlie's head to begin extracting information, he is stopped by the power going out. 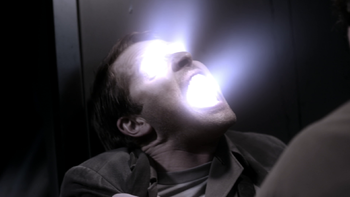 As the angels secure the area, Castiel realizes they are under attack and flees. Making his way to his Humvee, Castiel is stopped by his alternate Earth doppelgänger. Seeing another version of himself, Castiel finds it fascinating. While held at blade point by Cas, Castiel questions why he aligns himself with humanity and tells his double not to judge him, claiming they are the same. Cas agrees with his statement, but states that he vastly prefers humans over angels before driving an angel blade into Castiel, killing him. While interrogating Dark Kaia, Dean mentions how she's like the Apocalypse World version of Castiel, calling him "Bad Cas." 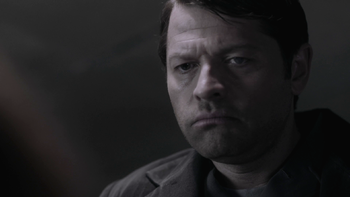 Michael tells Cas that his version of Castiel wouldn't be so "anemic" compared to the one fathering a nephilim. Castiel's accent was not scripted and was something Misha decided upon after seeing Apocalypse World Castiel's wardrobe for the episode, a choice Misha has apologized for since the episode aired. This page was last edited on 10 February 2019, at 11:10.